I made these cookies for Thanksgiving last year as well. For some reason they didn't turn out exactly as I remember them. I have a few ideas as to why this is, but until I make them again I can't confirm my suspicions. 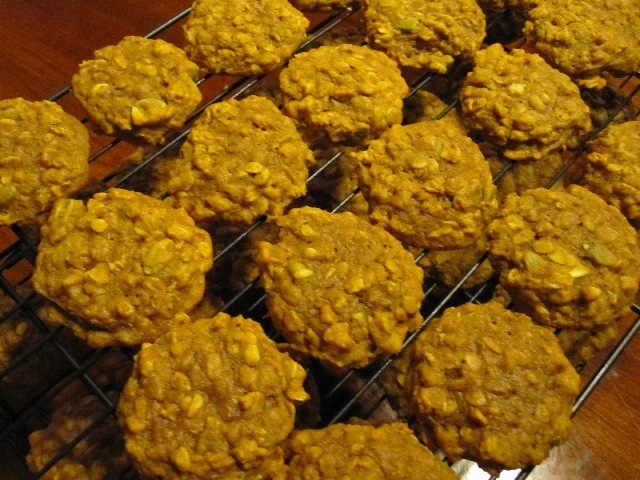 The original recipe that these are based on were more of a pumpkin cookie with oatmeal rather than an oatmeal pumpkin cookie. My brother (who complained doesn't get mentioned enough :)) loves oatmeal cookies, so last Thanksgiving I went looking for one with pumpkin but couldn't really find one with enough pumpkin or oatmeal. So I decided I would pretty much make my own with a pumpkin cookie as a base. The results did not disappoint, soft, chewy, and they tasted like pumpkin pie. What more could you want? When I made these cookies last year I added chopped pecans but found the distribution way to uneven, and when you did get some you didn't notice. This year I decided on pumpkin seeds (which I wanted last time but couldn't find), and it's exactly what these cookies need. I highly recommend this addition, not only does it break up the texture, but they also add this wonderful contrast in flavour. And heed my warning, if these cookies spend any time in an air tight container they become SOOOOOFT. Super soft in fact. The kind of soft that makes you think you might have accidentally made tiny cakes. If you have ever made pumpkin based cookies you probably know what I'm talking about. There is so much moisture in pumpkin that it's hard to make anything remotely crispy (trust me I've tried) and when you do, good luck keeping them that way. This year though, I do think they were softer than last. I have a number of ideas as to why this is. The first, baking time. I may not have chilled every batch before baking last year, so I could have probably increased the time or just avoided the chilling. The second possibility is that there was a little more flour in the recipe last time, since I was not using standard measure but the scoop and sweep method. I'm also sure I used Demerara sugar last year. And although there is more molasses, the crystals are much larger and don't dissolve as quickly, which should produce a crispier cookie. This is also why I think the cookies were a little sweeter than I remember. As well, last Thanksgiving I didn't have a mixer, I did the entire recipe by hand, so I may have inadvertently over mixed the batter. So it's my recommendation to do this one the old fashioned way. But the final reason they were so soft? My mother. She decided to make a cherry glazed ham for Thanksgiving dinner. Which turned out to be one of the best pieces of meat I have ever eaten in my life. Period. However, the cooking led to the house being extremely warm. As a result, the cookies got really really warm, really really soft, and really really sticky. Really. But just so you know: the cookies could have burst into flames, melting into a pink goo that feeds off of anger and hate, powering an ancient evil trapped in a painting, and it would have been worth it just to eat that ham. It was mind bogglingly good. And don't get me wrong the cookies still tasted great. My brother (not that one) seemed to enjoy them especially, I just wish they were a little more crispy. Oh, another warning, if you choose not to half this recipe you're going to get a lot of cookies. Not that that's a bad thing. Can you ever really have too many cookies, particularly at a time like Thanksgiving, where the challenge is to see how much food you can shove into your mouth before you're forced to swallow :)? In a medium bowl add flour, baking soda, pumpkin pie spice, cinnamon, and salt and whisk to combine. Add oats and whisk until everything is combined and all the oats are covered in flour. In a large bowl cream together butter and sugar until smooth. Add egg and mix completely. Add pumpkin puree and vanilla and mix until completely combined. Slowly add the dry ingredients to the wet and mix until completely combined. Add pumpkin seeds and fold into batter. Drop by rounded tablespoons on to cookie sheets (I used my Medium Cookie Scoop). Bake on centre rack for 11-13 minutes or until edges of cookie are golden (I was baking at 11 minutes, you might want to go to 13 – original recipe said 13-15, in my oven this would have been far too long). Allow cookies to cool on cookie sheet for 2 to 3 minutes before moving to rack to cool completely. HA HA mom loves you :P. On the actual cookies, I had them for dinner on that Monday :D. Best Pastry based dinner this year.